Despite the rain, the ASU Social Insect Expo held at the Desert Botanical Garden was the place to be last night. The room was packed with people of all ages interested in learning more about ants, honey bees and other insects. 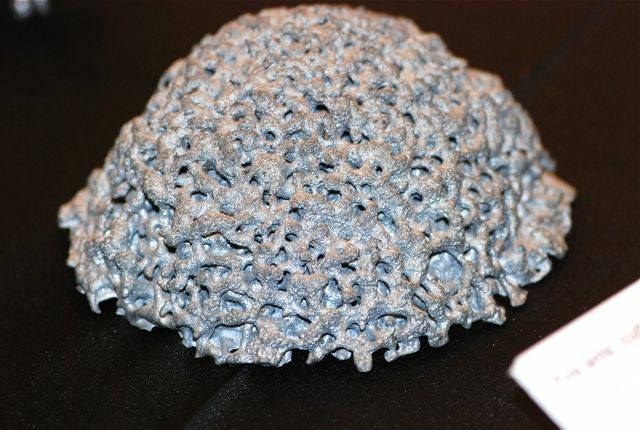 The exhibits included some metallic casts of ant nests. This is a fire ant mound. The casts are produced by pouring liquid aluminum or zinc into actual nests, and then after the metal hardens, digging them out. My husband and I think these would make great sculptures. 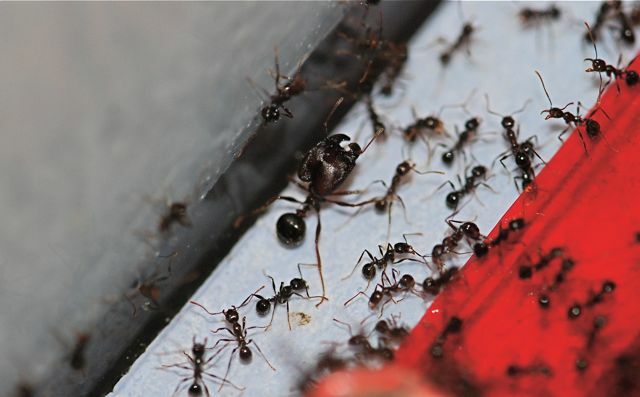 Live colonies of numerous species of ants were on display. Although I had no control over the lighting and shot through Plexiglas in some cases, I was able to get some okay photographs. These are two castes of the big-headed ant, Pheidole rhea. I’ll be using some of the others (honey pot ants, leafcutters, and acorn ants) in upcoming posts. Along with a honey bee demo hive, were exhibits of worker honey bees trained using Pavlov’s conditioning techniques. Something I hadn’t seen before were videos of live insects under Synchrotron x-ray imaging. Very cool tool! Overall, it was a lot of fun and good information. Given the obvious success of this event, hopefully there will be more Social Insect Expos in the future. Mark W. Westneat, Oliver Betz, Richard W. Blob, Kamel Fezzaa, W. James Cooper, Wah-Keat Lee. Tracheal Respiration in Insects Visualized with Synchrotron X-ray Imaging. Science 24 January 2003: Vol. 299. no. 5606, pp. 558 – 560. Mark W. Westneat, John J. Socha, and Wah-Keat Lee. (2008). Advances in Biological Structure, Function, and Physiology Using Synchrotron X-Ray Imaging. Annual Review of Physiology. Vol. 70: 119-142. We are living in Guadalajara area in Mexico.In September -October we have all garden infested with leaves cutters ants. effective prevention or chemical termination? I am afraid I am not an expert on leafcutter ants. I have heard of baits, which are granular materials that the leafcutters will pick up. Examples are granules of citrus pulp with an insecticide added. I recommend you try to find a local expert with experience in your area.